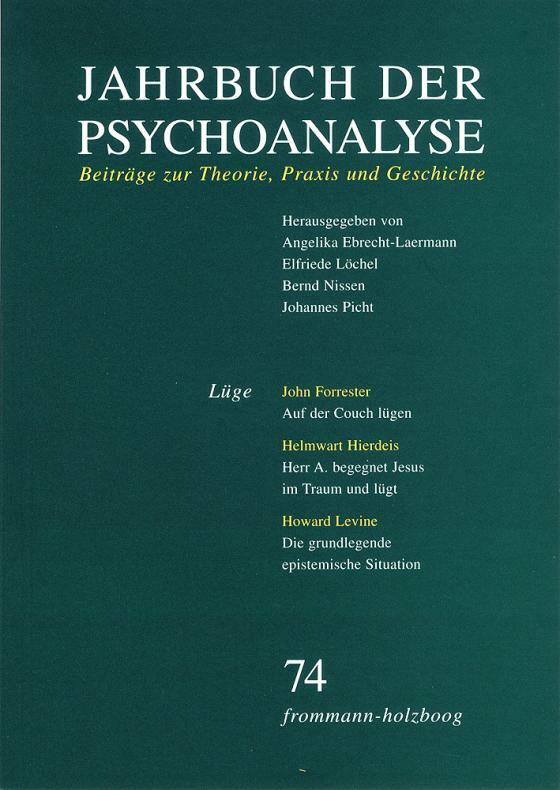 Following the work of Eickhoff (1988) and O'Shaughnessy (1998), the ›Yearbook of Psychoanalyses 74‹ on the theme Lie is dedicated to a relational dimension which has been widely neglected in the psychoanalytic tradition until now. This may be due to the fact that it was seen more as a contraindication to treatment. However, the underlying view that the liar is someone who is supposed to know what the truth is (Philipps in Forrester 1997) cannot be maintained. For, as occasionally someone who thinks to tell the truth is basically lying, it might as well be the case that someone who lies consciously, unconsciously tells the truth. So, how can we understand the problem of lying more precisely from the point of view of psychoanalysis? And, what role does lying play in psychoanalytic work? With contributions by Joachim F. Danckwardt, Angelika Ebrecht-Laermann, John Forrester, Gertrud Hardtmann, Helmwart Hierdeis, Helga Kremp-Ottenheym, Howard Levine and Peter Möhring.